Coffee is not our only passion. We are also passionate to help the forgotten children of Africa. After expenses, all profits from the sale of our coffee will be donated to Father's Heart International. Father's Heart builds schools in Zambia and educates children that have no hope of attending school. 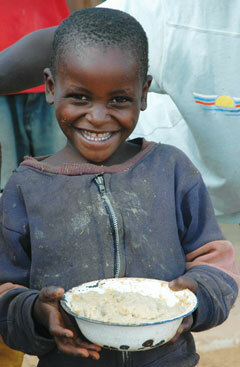 Due to starvation, they have a feeding program at each school to give the children a chance at life. Give a child hope by buying your coffee from Mt. Whitney Coffee. Many of our Mt. Whitney coffees are "Shade Grown" and Certified Organic. A "Shade Grown" coffee has better flavor because the growing time is slowed down by the shade. This gives the coffee time to develop complex flavors and sugars. Shade coffee farming, (as opposed to clear cutting for full sun), creates healthy soil content, protects the environment for a myriad of animals and birds, fights global warming, and creates a better quality coffee. It just makes sense. Our passion brings you truly unique and delicious coffee that is sourced in micro-lots and imported to the foot of beautiful Mt. Whitney. Years of experience have taught us that small-batch roasting is the best way to highlight each coffees natural flavor. Each coffee we offer is roasted and cupped several times in our coffee lab to determine the ideal roast profile to bring out the best flavors and balance. We roast and ship daily to provide the freshest, finest cup you will ever taste. During the last few years we have been truly fascinated by the delicious flavors of the Geisha variety of coffee. High-grown Geisha Coffee trees produce small quantities of coffee cherries that need to be hand-picked once a week during harvest to ensure the best flavor profile. It's a rare, expensive coffee, but after you taste it you'll find yourself always wanting to taste another exquisite Geisha. We know you'll love our featured coffees because they are on our top sellers list!